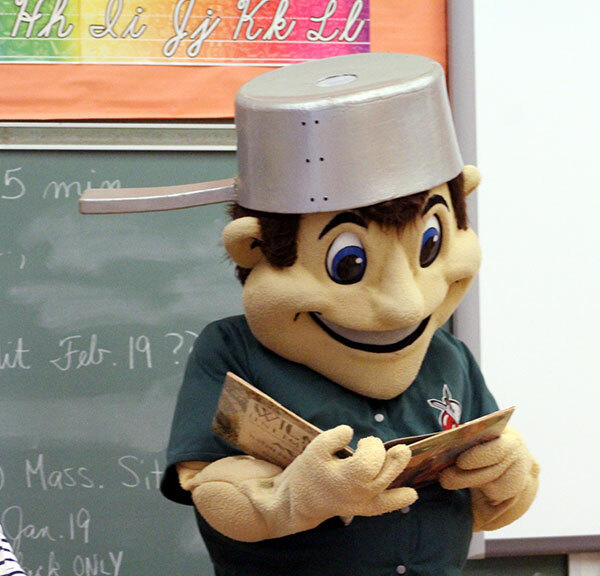 DELPHOS — St. John’s Elementary School students were ecstatic to have a visit from none other than Johnny TinCap, the mascot for the Fort Wayne TinCaps Minor League baseball team. Sporting his signature No. 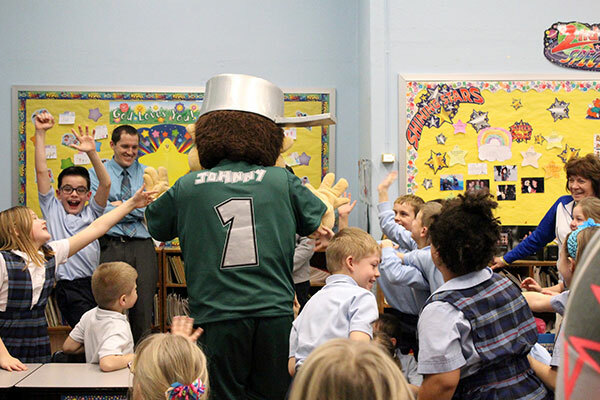 1 TinCap jersey and tin pot cap, he visited the elementary school classrooms with his friend and chauffeur for the day, Tara Cahill, to talk about the details of the reading program and ask the students trivia questions about the history of the TinCaps, including the previous name of the team and mascot friends, as well as the inspiration for Johnny TinCap. Students were able to ask a few questions about the team, the reading program and their new friend, Johnny TinCap. The TinCap Reading Program is hosted through the Ft. Wayne TinCaps to promote literature and reading in and out of the classroom. Schools that participate select the amount of minutes the students have to read in order to complete one base - the end goal being to hit a “home run” to earn the free ticket. Last year, St. John’s students were to read 90 minutes to complete one base. This year, the amount of minutes has increased to challenge the older students. Grades K-1 have to read 90 minutes for a base, grades 2-3 have to read 100 minutes, grade 4 has to read 110 minutes and grades 5-8 have to read 120 minutes. When students complete and submit their reading program time sheets, they are awarded a ticket order form to redeem a free TinCaps ticket. On their game day, students receive a free hot dog, chips, drink and a surprise grand prize gift. At the end of the game, students are invited to stay afterwards and run the bases with Johnny TinCap and participate in other fun activities. The game day St. John’s students will be attending is April 17 at 3:05 p.m. at Parkview Field. Friday marked the kickoff of the program and will conclude on Feb. 16. For more information pertaining to the Ft. Wayne TinCaps or the TinCaps Reading Program, visit www.tincaps.com.